Join Washington Revels Maritime Voices at the Folklore Society of Greater Washington’s annual “Mini-Fest” from 1:45–2:45 pm. The Voices will present a program of sea chanties, songs of women and seafaring families, and other songs of sea and shore on the Cafetorium Stage that will keep you singing, laughing, and learning the whole journey. 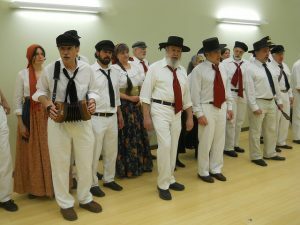 And be sure to come early and stay late for a whole day’s worth of performances, dances, workshops, and more (including the Festival’s “Shanty Sing” from 4–5 in Room. 114)! For information about the FSGW Fest, including the full schedule of events, click here. TICKETS: Tickets are available for half and full-day pricing (special pricing for families); discounts for FSGW members (see FSGW’s website for details).